Faith is not lost in the regular methods of farming but some worries have been transferred to the sheltered oasis of HPM Aasra. The above-mentioned statement is the best way to describe the role of HPM Aasra in many agro-based endeavors. HPM Aasra is a silicon Based Super Spreader, it is an agrochemical that ensures a sustainable shelter for crops against the problem of insecticides, fungicide, and herbicides in the easiest possible fashion. The same super spreader also acts as a plant growth regulator by acting with the performance of fertilizers and micronutrients. An adjuvant is a kind of universal makeup or a booster that helps a plant in covering up these deficits. An adjuvant like Aasra is made of surfactants, emulsifiers, oils and various types of salts. The right proportion of these elements along with the right standards of the preparations manufactures a spray like a chemical. A simple spray of this chemical on crops can do wonders. Just like every other natural system, the agriculture system is also under tremendous pressure from the natural increase in the population. An average farmer is trying hard to get extra crops from the field. As a result, the soils are not getting enough time to regain their nutritional values. Weather patterns are changing and posing new challenges in front of the seeds and the plants. The external threats are also finding new ways to haunt the growth of seeds and plants. Every new generation of the insecticides is emerging as more powerful in comparison with the previous generation. This is why the immunity system of a regular plant also needs a boost. 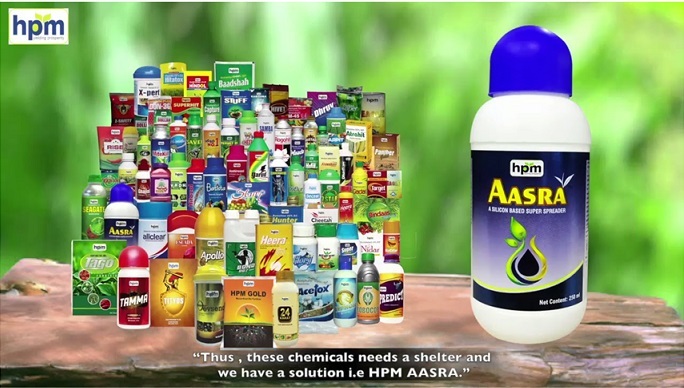 HPM Aasra supports certain functions in the plant that can ensure this additional strength in them. In the absence of an agent like HPM Aasra all, these factors combined together are putting extra pressure on our crops and forcing them to produce less. Aasra spray figures out the deficit areas of the crops and supports them in furnishing the process. For instance, if the herbicides are not working properly in favor of the growth of the plant, then Aasra spray can support them by activating the micronutrients that are present in the plant. If a booster spray supports a single function in the plant, as a result rest of the functions automatically follow and ensure a better growth of the plant. Spray properties of an adjuvant supports them in spreading across the plant and support maximum surface area for the better results. Aasra supports a silicon-based adjuvant; silicon-based spray booster is the latest technology. When we talk about Aasra in particular then we can say that its water tank based technology adds a new efficacy in the spray and allows it to spread evenly on the surface of the plants. This additional power to spray creates its affinity with the existing agrochemicals and pesticides that are present on the surface. Aasra is a versatile spray booster; it can also be considered as a tonic for the crops. It can be used on a variety of crops quite effectively to ensure the best and healthiest yield from those crops. For further information, HPM India can be contacted here, Facebook, Twitter, Linkedin, Youtube.